In science fiction: George Orwell’s 1984 introduced Big Brother, a totalitarian government spies on its own citizens anywhere and everywhere. In reality: Whether you agree that the government is “totalitarian” and has become infused with “thought police” or not, it’s hard to dispute that the technology for such surveillance exists. From the growing ubiquity of security cameras to biometric identification to facial recognition software, to yes, even red light cameras, Big Brother is not just feasible—it is here. Whether or not we’re employing that technology in the right ways remains open to considerable political, ideological, and ethical debate. In science fiction: Remember that scene in Back to the Future when Marty McFly gets fired—complete with the “You’re Fired” fax—over video phone? Or how Mr. Spacely used to interrupt George Jetson’s procrastination by appearing over his video screen suddenly (always yelling “Jetson!”)? Or how Darth Vader was able to talk to the Emperor in The Empire Strikes Back—long before we met him in person in Return of the Jedi? Yes, instant video calling has been a staple of science fiction for years. And yet we still seem married to the antiquated telephone Alexander Graham Bell invented over a century ago. In reality: That sci-fi fantasy, my friends, may be changing. The technology for video calling has been around for a while now, but it never really caught on before because it was choppy and cumbersome. But with newer, internet-based modes of communication—and faster broadband connections—it’s now possible to video call quickly, easily, and cheaply. Video teleconferences are now common office protocol. And forget about calling across the city or country; services like Skype allow one to call across the world—for free. Take a look at this amazing video of technology in action, as a group called Global Nomads Group, a non-profit organization that creates education programs and media about global issues for youth. Using interactive technologies in the classroom, such as live video-conferencing and multi-media videos, young people from around the world learn about and discuss the global issues that affect their lives. Here, they are using video conferencing technology by Polycom to connect schools with scientists working on the Offshore New Harbor Project in East Antarctica. The scientists are able to communicate with the students about climate change while conducting research. In the years since it was first introduced, Skype and similar services have only increased in popularity. In January of 2010, Skype even announced that it would offer high-definition video calls on new TV models! And no, maybe it’s not quite as common yet as a regular audio-only phone call, but give it a few more years. By 2015, maybe Marty really will be able to get fired via video phone. Can intergalactic calling really be far behind? In science fiction: From The Six Million Dollar Man to The Bionic Woman, the idea of the cyborg has been a popular one in science fiction for a long time. But perhaps the most famous techno-enhanced being is Arnold Schwarzenegger’s Terminator. Picture it. 1984, Los Angeles. A woman named Sarah Connor has been targeted for termination by a cyborg assassin called the Terminator, because she will later give birth to a son named John Connor, who will rescue humanity from the machines. One could go on. But it’s best to just to show you a clip. In reality: Sounds far-fetched, right? Actually, the idea of human parts enhanced by technology isn’t as unrealistic as it sounds. Scientists have been working on improving prosthetic limbs so they look, feel, and behave more like real limbs. This article talks about the “Luke hand,” an artificial limb so advanced it can fool the amputee into thinking that it’s actually connected to their nervous systems. Or this article, which talks about a prosthetic arm fused with an amputee’s own skin and bone. Finally and most fascinatingly, robots are becoming more and more human-like and “smart.” Just yesterday, ScriptPhD.com posted an interview with the science advisor of Caprica, himself a robotics engineer. If the Terminator isn’t here yet, it will certainly be possible soon enough. Just don’t tell Linda Hamilton. In science fiction: Teleportation, the transportation of people and objects from one place to another instantaneously, has been used in many works of science fiction. One personal theory is that teleportation in science fiction prevents that dreaded e-word: exposition. Seriously, who would watch a sci-fi movie where two hours are spent in a spaceship with the main character asking, “Are we there yet?” To conjure up the most famous use of teleportation, it only takes four words: Beam me up, Scotty. In reality: Okay, so we’re not beaming across the universe… yet. But scientists have been able to transmit photons—a particle of energy that carries light—across distances. Of course, the original photon is destroyed in the process. Teleportation might sound cool, but I’m not so sure I’d want to risk that. In science fiction: From H.G. Wells to Audrey Niffenegger, time travel has been a staple of science fiction for a very long time. It’s tantalizing: the idea that we could witness the past long after it’s gone, or see the future long before it actually happens. It’s too good to pass up! Take a look at this comprehensive collection of time travel in science fiction, dating all the way back to 2000 BC! In reality: No, there are no time machines. Not yet. Maybe not ever. But scientists from Stephen Hawking to Carl Sagan are still debating its possibility. 50 years ago, things like cell phones and personal computers were science fiction. 50 years from now, who knows? Although, I can say one thing: if and when the time machine is ever invented, it probably won’t be a Delorean. What are some of your favorite sci-fi inventions of yore that are now common techno-gadgets?? “From Science Fiction to Reality,” is an original article by CC2K books editor Beth Woodward. 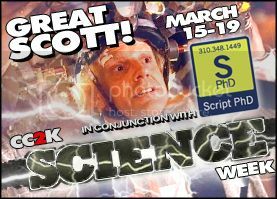 Science Week 2010 is a collaboration between ScriptPhD.com and CC2K. so much geekery at it’s best!